Hypersensitivity reactions are rare and may be due to preservatives rather than the anesthetic itself. Lidocaine and bupivacaine are both amide anesthetics and may have allergic cross-sensitivity. Procaine, an ester anesthetic, may be tolerated in patients with true allergic reactions to lidocaine. As with digital nerve blocks, epinephrine-containing solutions have been traditionally avoided because of the theoretical risk of extremity ischemia from arterial constriction. However, reliable reports of this complication, even in digital nerve blocks, are lacking, and recent studies of epinephrine-containing solutions have shown more benefit than harm for that application. 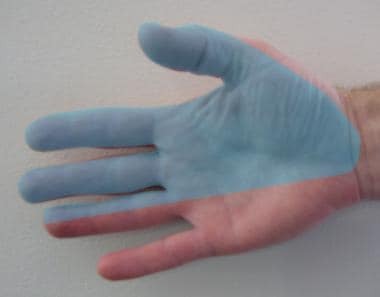 In the case of median nerve blocks, epinephrine is unlikely to decrease bleeding at the site of injury and cannot be advised for this purpose. A 25- to 27-gauge needle is appropriate. A smaller needle is less likely to cause direct nerve damage and causes less pain with injection. However, smaller needles do have disadvantages. 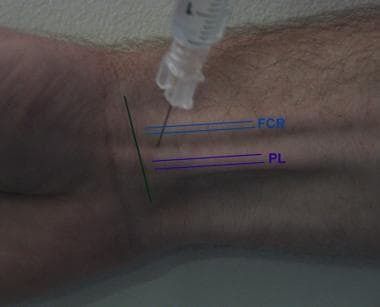 With a smaller needle, confirmation of intravascular location by pulling back the plunger is more difficult. Also, a smaller needle may also elicit less paresthesia prior to injection, if placed intraneuronally. Elevate the bed and place the patient’s arm on a Mayo stand or other support. Place a small roll under the wrist to extend the wrist slightly. Frenkel O, Liebmann O, Fischer JW. Ultrasound-guided forearm nerve blocks in kids: a novel method for pain control in the treatment of hand-injured pediatric patients in the emergency department. Pediatr Emerg Care. 2015 Apr. 31 (4):255-9. [Medline]. Waterbrook AL, Germann CA, Southall JC. Is epinephrine harmful when used with anesthetics for digital nerve blocks?. Ann Emerg Med. 2007 Oct. 50(4):472-5. [Medline]. Bartfield JM, Ford DT, Homer PJ. Buffered versus plain lidocaine for digital nerve blocks. Ann Emerg Med. 1993 Feb. 22(2):216-9. [Medline]. Liebmann O, Price D, Mills C, Gardner R, Wang R, Wilson S, et al. 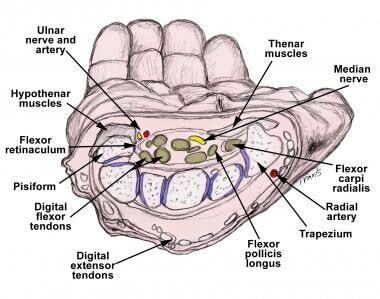 Feasibility of forearm ultrasonography-guided nerve blocks of the radial, ulnar, and median nerves for hand procedures in the emergency department. Ann Emerg Med. 2006 Nov. 48(5):558-62. [Medline]. Sehmbi H, Madjdpour C, Shah UJ, Chin KJ. Ultrasound guided distal peripheral nerve block of the upper limb: A technical review. J Anaesthesiol Clin Pharmacol. 2015 Jul-Sep. 31 (3):296-307. [Medline]. Frederick HA, Carter PR, Littler JW. 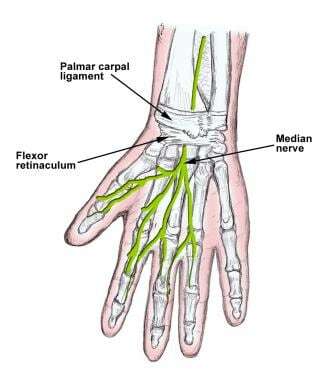 Injection injuries to the median and ulnar nerves at the wrist. J Hand Surg [Am]. 1992 Jul. 17(4):645-7. [Medline]. Valvano MN, Leffler S. Comparison of bupivacaine and lidocaine/bupivacaine for local anesthesia/digital nerve block. Ann Emerg Med. 1996 Apr. 27(4):490-2. [Medline]. Disclosure: Received income in an amount equal to or greater than $250 from: Gilead Sciences.